MP4 is one of the most widely used format that is accepted by most devices, media players and video editor software. It has a good compromise between video quality and file size. If you want to convert Blu-ray to MP4 so as to play, edit or share your Blu-ray movies more conveniently, now just follow this article to finish the conversion while reserving the original video quality. Actually, there are many tools that can convert Blu-ray files to MP4. Here a first-class tool, EaseFab Blu-ray Ripper, is recommended as the best Blu-ray to MP4 converter. With it, you can easily get MP4 video from Blu-ray disc with fast ripping speed and high video quality bypassing all known AACS protections and BD+ protection. 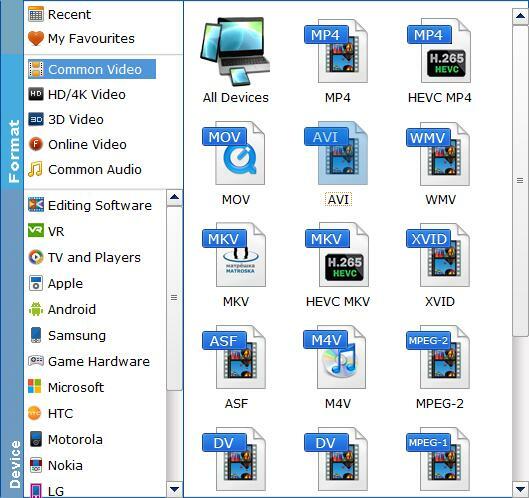 Apart from MP4, it can also convert Blu-ray to AVI, WMV, MOV, M4V, MKV, FLV and more popular video formats. Moreover, it provides the MP4 video presets with the best settings for iPhone, iPad, iPod, Android tablet/phone and more. Just get this smart converter and follow the steps below to convert Blu-ray movies to MP4. After downloading, install and launch the program. Insert your Blu-ray disc into your BD Drive (necessary for ripping Blu-ray) and click "Load Blu-ray" button to upload Blu-ray files. At the bottom, you can select your desired subtitle and audio track. Once you're sure all the settings are OK, click the Convert button to start converting Blu-ray to MP4. The conversion time depends on the quality and duration of the output movie. When it completes, you can play them on your iPhone, iPad, iPod, iTunes, QuickTime and virtually anywhere you like! Just enjoy them! Why Do You Need to Convert Blu-ray to MP4? Blu-ray disc offers high storage capacity (approximately 25/50GB) to store any kind of digital data, and allows us to watch content in the disc via Blu-ray players. However, it also has some defects that push many people to rip Blu-ray to digital file (MP4 is preferred choice) and save it into other storage devices. Children always break Blu-rays. So do adults. Blu-rays are vulnerable to warping, scratching, and breaking when aged, and stored or used improperly. When a disc is damaged, several or hundreds or thousands of sectors will become unreadable. Therefore when you play it, you may encounter problems like "sometimes it plays properly and sometimes it skips or even aborts", "when Blu-ray is inserted, it doesn't seem to read or load", and "Blu-ray playback keeps freezing". MP4 is easy to store and manage, and hard to be corrupted. A digital MP4 copy is much easier to store and manage. You can save it to computer hard drive, external hard drive, flash drive, iPhone, Android, etc. Besides, you can categorize all the MP4 videos ripped from DVDs by genre, by year, etc, and name them according to your own needs. When you need certain file, you can locate it effortlessly from well-organized list or by searching. Unlike fragile Blu-ray discs, MP4 files are difficult to be damaged during the regular use. Blu-ray occupies much space of our room. Blu-rays are cumbersome to store, thus becoming a headache for those who have collected an enormous number of Blu-ray discs. They desperately need nice Blu-ray storage ideas and are often suggested to convert Blu-ray to MP4 or other digital files, in that this method can help save much room space and find target item easily. MP4 takes up less space than others as keeps high quality. MP4 features high compression rate and great output quality. Therefore, it delivers smaller file size than other formats when set as the same quality. Regional lockout causes Blu-ray won't play error. Virtually all commercial Blu-rays have region codes [wiki] which only permit the discs to be played on Blu-ray players that have the identical codes. For instance, if you live in America (where Blu-rays and Blu-ray players have a region code of "1") and purchase a Blu-ray from British (where region 2 is employed), you probably fail to play it on your player. MP4 is accepted by almost all devices and programs. MP4 is compatible with almost all electronic devices, including computers from different brands, Apple iOS devices, Android phones and tablets from Samsung, Google, HTC, Microsoft, Sony mobiles, tablets, game consoles, and so on. That is to say, after converting Blu-ray to MP4, you can keep MP4 copies with you and watch them on the train, airplane, bus, etc. In addition, MP4 is accepted by many software programs (e.g. iTunes, iDVD, iMovie) and web services (e.g. YouTube, Facebook, Vimeo). So, you can do more things you like.